Since my early years, beautiful handwriting has always fascinated me. When I was in fourth grade, my father and I discussed cursive. He and I both admired excellent penmanship. As a schoolboy in the 1930s, he had been taught a style of writing I would later come to know as the Palmer Method, which had been introduced by Austin Norman Palmer in 1884. Students who learned this method of penmanship were first taught a series of joined circles and joined slanted lines on a slate at their desks. They then progressed to motifs, the individual strokes which made up each letter. Finally, the students advanced to forming letters and words. My father suggested I try some of these penmanship exercises. He said he and his classmates devoted quite a bit of classroom time to mastering the art of beautiful writing, and I could see this in the way he signed his name. When I began teaching second grade at Classical School of Wichita in 2006, I devoted about ten minutes per day to handwriting instruction. Students practiced in a workbook, and when they completed the workbook about mid-year, they began to copy verses of scripture in cursive. 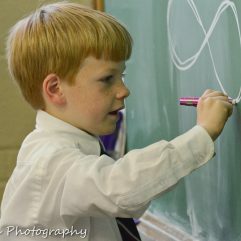 By the third semester, most of my students’ daily work and spelling tests were completed in cursive. I considered handwriting a minor, yet vital, part of the classical curriculum. In 2011, I took a class from the National Institute for Learning Development to learn how to teach students who experience learning difficulties, especially learning to read. In the class, I learned mastery of handwriting contributes to success in many other areas of learning, including reading, spelling, composing, and critical thought processes. One of the main techniques used with students who have learning difficulties is “Rhythmic Writing”—this technique is essentially the same as the former penmanship lessons my father learned in the 1930s. It consists of a series of figure eights and motifs done with oral rhythmic counts on a wall-mounted chalkboard. Students then complete a series of letters and words at their desks on laminated poster board mats, using metal writing frames that hold markers. (The writing frames train students’ fingers to hold a pencil with the proper tripod grip.) This transition from gross-motor movement with oral counts, to fine-motor movement with internalized (silent) counts, helps students comprehend the ‘grammar’ of handwriting. Once I began to implement these methods with my students, I noticed marked improvement in their ability to master cursive. This was particularly exciting as I learned more about the modern neuroscience research that supported the value of writing by hand, especially cursive writing. Researchers, using fMRIs (functional Magnetic Resonance Imaging), have shown that handwriting activates the part of the brain responsible for reading, writing, oral language, and higher level thought processes. This work is cited in the article, “What’s Lost as Handwriting Fades,” which describes the work of Karin Harman James, Ph.D., of Indiana University. Handwriting fluency impacts performance across all academic subjects, influences reading, writing, oral language, and critical thinking, and provides a foundation for the logic and rhetoric stages. As a classical educator, I am delighted to embrace teaching the ‘grammar’ of cursive handwriting, knowing that handwriting mastery plays a critical role in the cognitive development of students and provides an opportunity to invest truth, beauty and goodness in their lives.